Please note, Two Doors Down is now closed. Time Out Food & Drink editors, Oct 2016. The slightly rundown lower reaches of Kentish Town Road have been acquiring an increasing dose of gastro-cred, and this utterly winning coffee shop opened in May 2014. Two Doors Down is tiny, with seating for just a few people upstairs and another ten or so downstairs; there are also tables outside. The owners’ warm and friendly attention to customers must account in large measure for their devoted local following. So does the coffee, made with Allpress beans. Milky drinks are executed flawlessly. Espresso has been slightly less consistent, but steady improvement shows that they’re learning well. Food is simple but excellent: quiche, salads, sandwiches and baked goods (check out the spicy quail’s egg sausage roll). Prices are sensible. In all, a place to cherish. Lucky K-Towners now have a second coffee place to rival the much-loved The Fields Beneath. The greatest coffee shop in London! Delicious allpress coffee, the yummiest sausage roll and great for a granola breakfast. The goat's cheese and beetroot toast is also the BEST hangover cure! And the owners couldn't be more welcoming and friendly - you feel part of the family as soon as you step through the door! Well what can I say ...Let's start with the warm welcoming me and my friends always receive from the friendly staff (which you don't always get in the big chain coffee shops !) I study over the road in the academy once a week and always look forward to popping in two doors down on my break hands down its my favourite coffee shop in London ! Great service and the food and drinks are amazing . The friendliest of welcomes and very helpful too. The most beautiful and tasty breakfast porridge ever! A real gem of a place. I can't wait to see you again soon. Great coffee and lovely people. Go and try them. Great place to have a superb coffee, tasty snack and an interesting chat with the owners and customers alike. 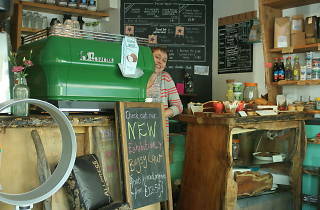 Great coffee and Rich and Klara are the friendliest people in North London. Also amazing food - sausage rolls and lovely brownies. Sip on a knock out Allpress coffee while admiring all their cool vintage furniture and paraphernalia. What really makes this place special though are the staff - they are all sunshine and sparkles. Wonderfully, friendly, independent coffee shop. The owners are really welcoming. Highly recommend. Need to try the food, so far have just popped in for coffee. 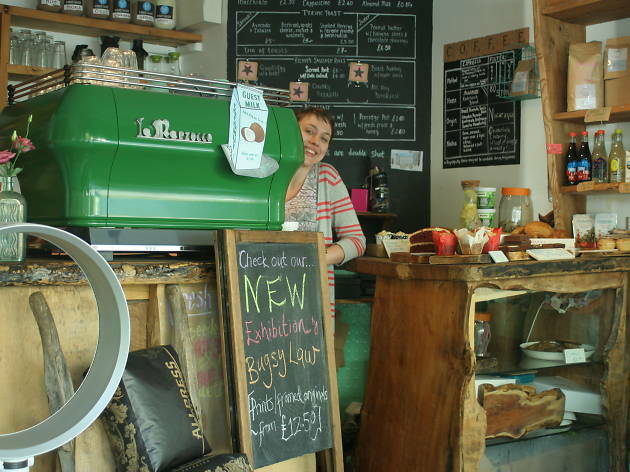 The best coffee in London is served in this friendly neighbourhood coffee and cake shop. It doesn't hurt that the owner makes a blinding sausage roll either. This place just gets it right. It's as simple as that. Standing proud in the not-so-great end of Kentish Town, Two Doors Down is great for everything; from fabulously manipulated Allpress coffee, stonking customer service from Richie & Klara (I've never known a warmer welcome anywhere and to all their customers to boot), great grub (see pics of Sweetcorn Salad - get it if it's on - and Trio of Toasts) and just a wonderful vibe. Supporting local, small batch suppliers (I mean, where else stocks mugs with Rio's painted on? ), this place oozes community and good vibes. Get yourself down there. And be sure to ask for "The Lillie" when you get there.